The day has dawned cold and windy but dazzlingly sunny and, in the allotment, somewhat sodden underfoot. The plots are deserted, save for the singing of blackbirds already sensing spring, and the odd jet black crow stabbing at the ground. Fortunately at this time of year the last thing the land needs is for someone to come along and dig. Its structure needs no intervention when the weather is wet or cold. I’m happy to leave the soil to rest and rejuvenate, disturbed only by the wildlife that reclaim the land over the winter months. I clear away the inevitable bird wing, no doubt left by the cat who likes to utilise my patch as a lure to its prey. There isn't much left in the ground to appeal to anyone or anything right now. A patch of leeks, which have grown well in the mild weather stand sentinel. Some over-wintering onions and garlic, which really shouldn’t be so far advanced at this time of year, could fool you into thinking spring really had arrived. They may pay for their forwardness if winter does eventually put in an appearance. A cluster of desiccated calendula flowers offer their seeds to passing foragers. Amazingly, a few flowers cling on, adding an unexpected flash of colour. Raspberry canes flex in the fierce winds and bide their time. Save for the skeletal soft fruit bushes, the rest is bare earth populated with the odd tenacious clump of self-seeded grass. Ah yes, the weeds. Thousands of enemies lying snug in their earth blanket waiting for the last of the frosts. They'll compete with the seeds I’ll start sowing sometime in March, but they'll also be a guide as to when to get started. When it’s warm enough for the weeds, it’s time to plant. Today I’m here to prune back those gooseberry and currant bushes to ensure a healthy crop come the summer. I cut out dead and crossing branches until I achieve the optimum vase shape which will allow good air-flow and make picking easier. The gooseberry bush likes to protect its fruit with the sharpest of barbs. Despite all my efforts, a fruiting season without scratched and torn forearms is one I’ve never achieved. 'My' robin has arrived. Perched on a spade handle only four feet away he fixes me with a hopeful "worms please" eye. I turn a little of the, relatively warm, compost heap and unearth a few lethargic wrigglers for his benefit. Every year is different in the garden. The only constant is what grows well one year will let you down the next, and something that didn’t deliver may well grow abundantly next season. I have no space to start off seeds under glass and no inclination to mollycoddle seedlings so everything goes straight into the ground. It’s thrive or die on my plot and as I grow biodynamically, I'm even more dependent on nature than most. Apart from the autumn-fruiting raspberry canes, which I’ll cut down to the ground in February to stimulate new growth, my plot is now ready and waiting for planting to start in March. A quick tidy up, a few of the smaller leeks pulled for lunch, and it’s time to leave the allotment to ‘my’ robin (and probably that pesky moggy) for a few weeks. So, what to plant this year? That’s a whole other pleasure to ponder. In the meantime, here’s a classic recipe for those leeks. Smaller leeks are best for this dish. The herb I use is chervil as I like the extra dimension of mild aniseed it brings to the sauce but it's more correct to use chopped chives or parsley, I think. Tip: If you dislike raw shallot, dice it and put it in boiling water for 30 seconds to take away the astringency before starting this recipe. Clean the leeks scrupulously. Drop them into boiling salted water for about 4 minutes, depending on size. Once cooked, plunge the leeks into iced water to stop the cooking and retain their colour. Dry throughly on kitchen paper. Put the diced shallot into a bowl and add the vinegar or lemon juice, salt and pepper and leave to marinate for 5 minutes. Whisk in the olive oil to form an emulsion. Add the diced cornichon and crumble in the egg yolks. Mix well. Dice the cooked egg whites and fold in with the chervil. 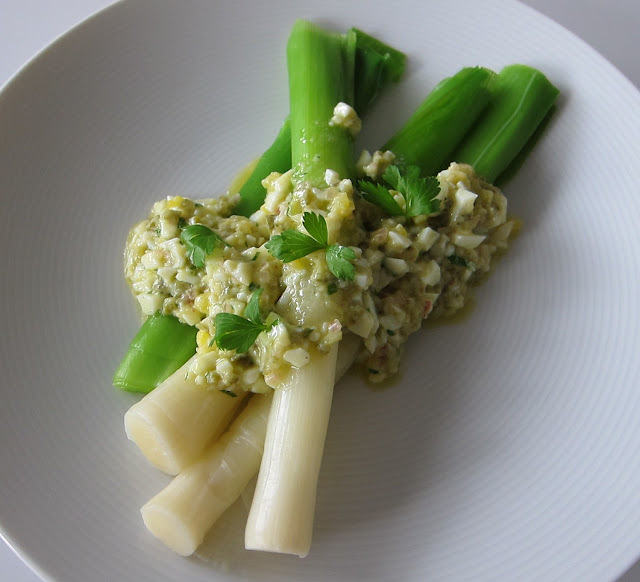 Serve the leeks with the sauce and decorate with a litte chervil. Christchurch Fish - London needs you!